Despite the fact that there's a Kre-O Devastator box set, it only contains four Constructicons. You can find a fifth, however, in the second series of blind-bagged Microchangers. In fact, he's pictured on the bag! You think you're good at building? No one is better than me. Back on Cybertron, I was the master of construction. The other Decepticons - those peasants - don't understand my art. But I shall persevere. I'll build what I want, no matter how often they knock my structures down and laugh at me. Special building material: Bricks. Obvs. The "Kreonsler" Building. Like the Chrysler Building, except a terrible pun. Hook was one of the original Constructicons, but since his name is so generic, Hasbro hasn't used it much in recent years. Usually the crane gets named Hightower, but this little guy is back to his roots. He gets the same black headgear as Mixmaster, Scavenger and Bonecrusher, and it's really impressive how well it works for all of them. His face is gray, with and orange visor and a frown. His chest is painted to resemble the comic art, and it looks really nice, but in order to attach the hook assembly to his back, you have to cover that up with a vest - a problem most of the Kre-O Constructicons have. In theory, you could probably cut the front off the vest and just leave the bit that goes around his neck and down his back - anybody out there tried that? How did it work? Hook's vehicle mode build is less than creative. At least Sunstorm, stupid as his altmode design was, changed things around a little. Hook's vehicle is just Hook's robot, lying on his stomach. The black headpiece has truck details molded on the top - windows, headlights and a grill - and he holds two extra tires in his hands. Of course, none of the wheels roll, but since his bodyparts don't actually clear the ground in this mode, that's probably for the best. His crane arm, which has two hinge joints in its construction, moves from the center of his back to the heel of his right foot. And it doesn't actually have a hook on the end of it - maybe they should have called this guy "Loop." If this were the only Constructicon available, I probably wouldn't have gotten him - and it's annoying that he doesn't get to be part of Devastator. But he looks right at home next to his four little buddies, and that is what brought him home for me. Now I just have to hold out hope that there's a Long Haul coming in a future series, so we can actually finish the whole team. Cutting off the front of the vest works great. Just place it upside down on a flat surface, get a sharp knife and place it against the front of the vest and apply pressure until you cut through. Quick and easy. 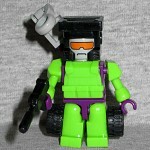 As for Long Haul, he's coming in wave three of the Micro Changers blind bags. Miles better with the cut vests! Thanks for the updated pic!